And finally here we go with the statistics derived from the cyber attack timelines of August (Part I and Part II), pronbably the most active month so far. As usual let’s start with the Daily Trend of Attacks, which completely reflects the high level of activity recorded. After an initial peak of activity, the first half of th month has been quite poor of activity, before the big bang starting from the 20th. 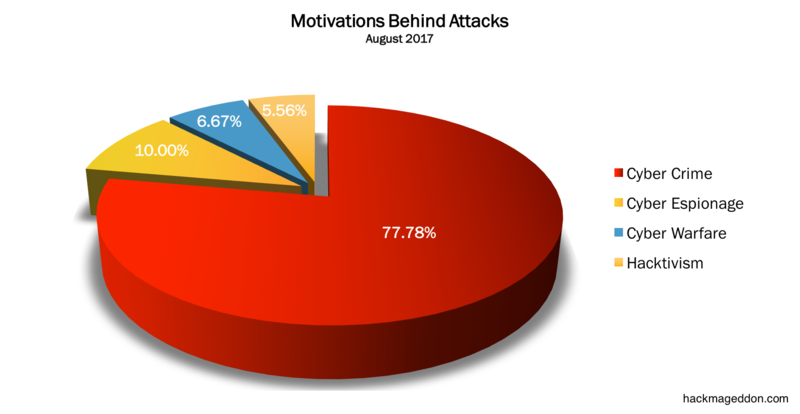 Again, Cyber Crime leads the Motivations chart with 77.8% in slight decrease compared witht the 84.1% of July. Cyber Espionage is stable to 10% (was 10.1% in July), whereas Cyber Warfare grows to 6.7% from 4.3%. Hacktivists are back to 5.6% from the modest 1.4% of July. The Attack Vectors chart is very similar to the one of July, at least for the first ranks. Again, it is dominated by malware stable at 34.4% (it was 34.8% in July). Account Hijackings rank at number two with 22.2% (it was 23.2% in July). Targeted attacks grow to 16.7% from 13% in July. For the second time in a row, the Distribution of Targets chart is led by Single Individuals with 33.3% (it was 27.5% in July). Industries slide to 18.9% from 26.1%, while Goverments grow to 10% from 8.7%. The Industry Drill Down Chart is led by Video Games, Software, Web Hosting, Oil and Gas, alll of them at 13.3%. These graphs would be much more intriguing and helpful, if we actually knew how many attacks were recorded, rather than just a percentage.